When Jim Harbaugh decided to take over as the head coach for the Michigan Wolverines, you got the feeling that there was about to be a shift within the landscape of college football. It’s not just that Harbaugh is one of the most respected and talented coaches in the game or that he was returning with the promise of lifting his alma mater out of the depths of despair, it’s that he has this aura about him. He’s energetic and intense and confident in his abilities. He moves to the beat of his own drum, bucks conventional wisdom, and challenges the status quo. 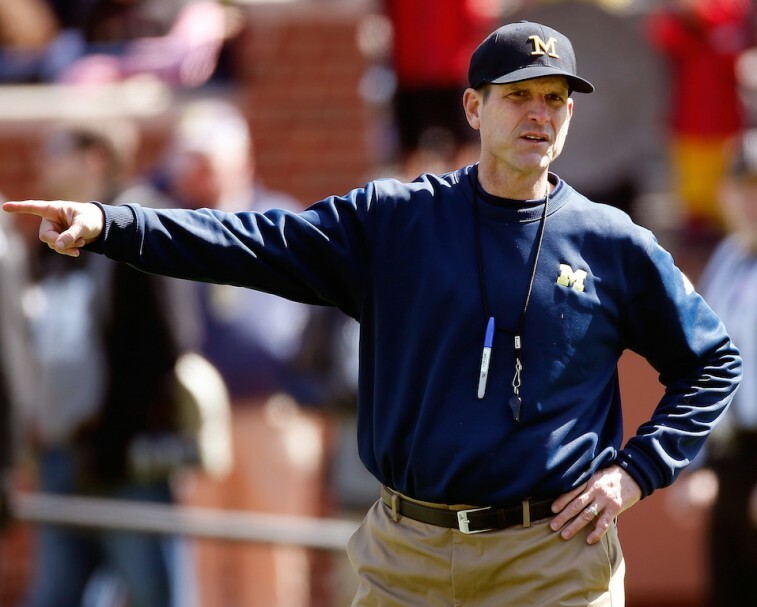 With his introduction of satellite camps and progressive recruitment methods through the use of social media, it became increasingly clear that people were already starting to respond to the Harbaugh mania. As a result of this magnetism, it was only a matter of time until everyone was going to want to be in bed with the Michigan athletic program. It would appear that that that time has officially arrived. On July 6, the University of Michigan announced it had reached an agreement with Nike that would make the apparel giant responsible for outfitting all the school’s varsity sports teams starting August 2016 through the 2027 season. As part of this agreement, the basketball teams would begin sporting Nike’s Jordan Brand. This is a big and exciting move; one that certainly says a lot about the direction folks see Michigan heading. At the time of the announcement, the financial terms were not readily available. However, that is no longer the case. Not only have the numbers been released, but by the looks of it, we’d say Nike has a lot of faith in the Michigan program — $169 million worth. If there was ever a reason to believe Michigan athletics — especially the football program — was on the up and up, this deal with the world’s largest apparel company simply confirmed it. Starting in the 2016-17 fall season, an 11-year partnership will begin, that will see the Wolverines sporting that famous swoosh. So how will the $169 million be divided? Let us break it down for you. The contract between Michigan and Nike is for 11 years guaranteed. However, there is an option for the university to extend the agreement for an extra four years, allowing the partnership to run through 2031. While the money for those final four years is known, it should also be noted that the cash and equipment deal for the guaranteed 11 years has been finalized. The total for those years is worth $122.3 million, with $65.5 million designated for cash and $56.8 million assigned for apparel and equipment. Based on the figures, the final — and optional — four years of the deal would be for $46.6 million in cash and apparel. That’s a lot of dollars just to outfit one university with your gear. In fact, the deal is the biggest Nike has ever committed to a public university. If you look at the numbers over 15 years, Michigan is actually receiving an average of $11.26 million per year in cash and gear from Nike. That’s a whole lot more than the $4.4 million Florida State received in 2014-15 from the world’s biggest apparel company; which is saying much considering the opposite trajectories that each university’s football program have been heading over the past few seasons. However, with Harbaugh onboard, perhaps the Wolverines’ fortunes will finally be turning around. It’s fair to say that Michigan football has been pretty much irrelevant the last couple of years. Yet, with one move, one monumental hire, the Wolverines appear ready to re-stake their claim among college football’s elite. 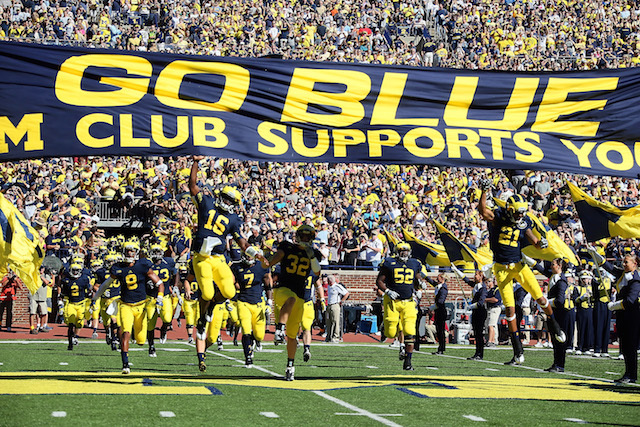 This is the perfect time to jump aboard the University of Michigan bandwagon. Nike is fully aware of this; which is why it just did it.